This show is now open in Los Angeles! Charles M. Russell (1864-1926), "The Scout", 1895, watercolor on paper, 13.5 x 18.5". Estimate: $335/325,000 Available at "The Russell", Great Falls, MT. Bill Anton has a major new show opening Saturday at Legacy Gallery in Scottsdale, Arizona. Start the day at 10 a.m. with a presentation by Bill that will take you behind the scenes on his new works, and then return to the gallery from 5-7 p.m. for the by-draw sale. Our March issue includes a feature on the A.R. Mitchell Museum of Western Art in Trinidad, Colorado. Mitchell was crowned the King of Western Pulp Covers, and a huge collection of his work is on view at the museum. Add this destination to your list of Western museums to visit! A new Robert Duncan show is now open at Trailside Galleries in Jackson Hole, Wyoming. It runs through March 16. Our March issue is on newsstands now and features a ton of great coverage on Western Art Week in Great Falls, Montana. One of the features is on Charles M. Russell and Andy Thomas Fine Art, whose works are linked to Great Falls in really interesting ways. See more in the March issue. Awesome sales today at Bonhams for the Brinkman sale. $8.4 million overall with the top lot being a Howard Terpning piece that realized $1.4 million. And so many bids in the room, on the phones and online. Grant Redden, "Day Dreaming", oil, 24 x 20". 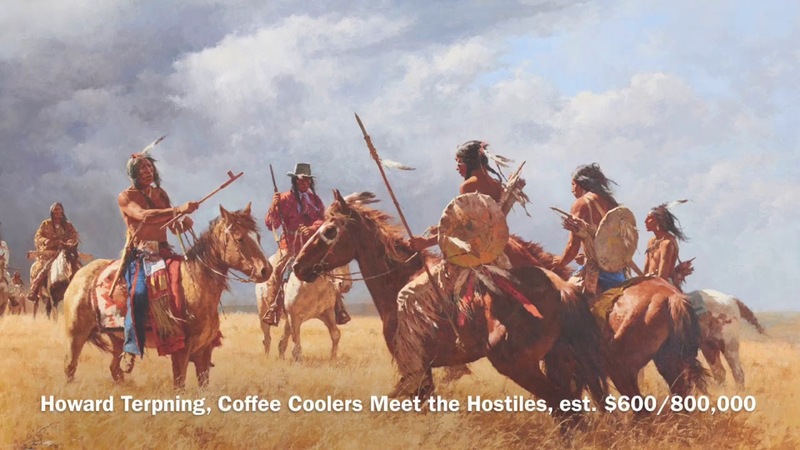 Available at Cowboy Crossings, National Cowboy & Western Heritage Museum, Oklahoma City, OK.
David Mann is on our November cover, and wow is it a powerful action-packed painting. It will be on newsstands and in mailboxes very soon! Ed Mell has a new show that will focus on works on paper that opens today at Ed Mell Gallery in Phoenix. The show runs through October 20.